If you're anything like me, and I imagine you are at least somewhat, you have been anything but perfect during the past year. I know in my own life, I've been proud, angry, discouraged, mean-spirited, unloving, judgemental, suspicious, lazy, arrogant and probably more than a little selfish. I am just a sinner saved by grace, and my daily living is often proof of that sinful nature. This weekend many people will use the New Year as their "reason" for starting anew. They will look for newness of life in diets, kicking bad habits and trying to do a 180-degree turn in other areas. 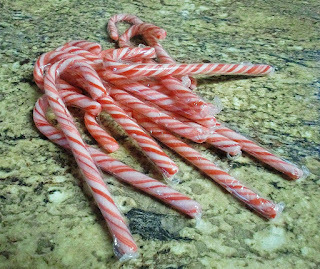 So, here's my pile of leftover, broken candy canes. These are the ones that I couldn't make into hearts yesterday because they've cracked and crumbled. We get into the kitchen and use them up! * Get fanciful and hang them around the kitchen. * Tuck them into plants, into cups and into glasses for a quick snack. * Offer them as an alternative coffee stir stick. * Drop them into a cup of hot cocoa. 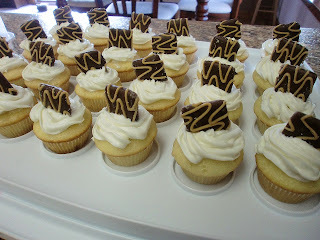 * Scatter them around a dessert plate as garnish. * Add to a party mix with popcorn, chocolate candies and other munchable goodies. * Sprinkle on top of chocolate cake. * Mix into no-bake cheesecake. * Stir into softened ice cream, then refreeze. * Add to the frosting of your favorite dessert. May the week bring you many candy canes, broken or otherwise. It might get your creativity working! It's not every day that I air my mistakes before the entire blogging world, but today is the day. I bought the wrong kind of candy canes. There was an amazingly cute craft in a magazine that I'd been saving for just this week, so I went to the dollar store and bought two packages of candy canes. They're all pretty and red and perfectly striped. But then I got home and reread the instructions. Instead of my pretty, edible candy canes, I needed the candy cane ornaments made of plastic. Real ones won't work. So, that one will have to wait until next year. And now I have 24 candy canes. What's a girl to do? 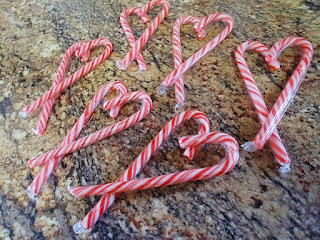 Make candy cane crafts and recipes! Yay! All you need are two candy canes and a hot glue gun. Please leave the candy canes wrapped, unless you plan to never, ever eat them. Human beings, women humans especially, tend to categorize themselves in funny ways. Ways very different from how God sees us. We measure our self-worth by physical traits - those we lack and those we have too many of. We judge our character by the things we've failed at more than our heart condition while we've attempted them. And we'll often be much more harsh on ourselves than we would ever be with someone else. There are many times when our self-critique prevents us from seeing the saved child of God that He sees. "How could the Lord love me when He knows who I am, what I've done and what I've been?" Isn't it amazing (and such a wonderful blessing) that God sees us through the blood of Christ. Because we've come before His throne in repentance, we are a new creature, completely covered in the crimson flow. What was once a lost, struggling, sinful person is now seen clean, pure and refreshed by the grace of God. Everyone's hurrying around this weekend - attending events and parties, shopping for numerous gifts and writing out the last of the greeting cards. Are we anticipating the event or the arrival? Make this weekend one of anticipation over the birth of the Savior. The other stuff can wait - praise and worship of the soon-coming King can't! Just wanted to let you know that the girls are having a wonderful time in their new home. There was a little anxiety at first, but everyone is now settled and adjusted to life in Iowa. 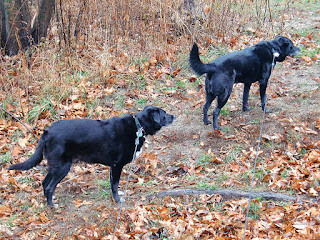 They love to be out on the property, sniffing for the deer, turkeys and the occasional raccoon. The woods surrounding us are the perfect place to do a little exploring. ﻿ And they're happiest when they can watch the world go by from the warmth of the inside. Bailey protects the house with all her heart, especially when there are birds and deer on the loose. It's a great time to be a puppy. Would You Like Your Ravioli Toasted? This recipe is so easy and so fantastic that I made it twice in one week. Restaurants everywhere have included it on their menu, but for a better value (and quicker service) you can make it yourself. 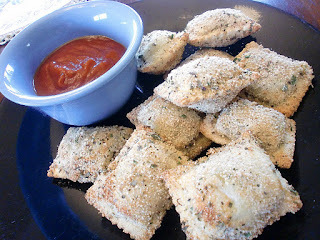 I found several recipes around and about for toasted ravioli, mainly because I didn't want the hassle of frying them. These are baked instead, and take just a few minutes in the oven. Interestingly enough, I had also screwed up some step in each recipe I had saved...yes, surprising, I know. So I had to modify and make things up as I went along to compensate. Mind you, my measurements are a little guess work - I added enough spices to make the bread crumbs smell just right and look really pretty. The exact numbers are really up to you. Take a whiff and decide what you like. 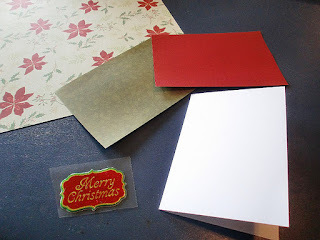 After a while I get tired of hearing people say that it's too time consuming and too difficult to make your own Christmas cards. Then they settle for some generic design that many other people will purchase and that may not say exactly what they'd like. Let me show you, in just seven pictures, how quickly and easily you can make a beautiful card to share the joy of the season. Step one: gather one blank card, one sheet of decorator paper, two coordinating scraps and one 3D embellishment. Yep...that's it. That took me about two minutes, mostly because I'm still not reorganized yet. Step two: adhere the decorator paper to the card and trim to fit. That took about a minute. Step three: with your paper trimmer, cut a small strip of paper, long enough to run top to bottom on your card. Then adhere it to the coordinating piece so there is a thin border on either side. This may take three minutes, tops. If you've been following along with the Daily Devotion on this site, you've just read through the entire Bible in less than 50 weeks. It's truly hard to believe that it's been that long, but it's been a blessed journey. We've watched the Lord of all Creation make a universe...and then create a man. 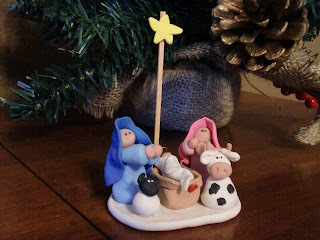 Through the miracle of His power He made that man a help meet, which started our own beautiful family. But we've also had to read about sin coming into the world and the need of man for a Savior. From the first chapter of Genesis to the last chapter of Revelation, we've clearly seen that scarlet thread that is the blood of Jesus Christ work its way through history. We've seen how God can use a shepherd, a slave girl, a king, a harlot, a publican, a Pharisee, a fisherman and thousands of other lives to give glory and honor to the King of kings and Lord of lords. If He can do that with this variety of people, what can He use me for? Our new home sits well off the road in a great area of trees. You can't see it from the highway and there is little traffic noise. It's not somewhere people just happen to be passing by, so when someone arrives in the driveway, it is normally planned and expected. And usually they are here for a purpose. Anyone who isn't here by invitation or to complete a necessary task for our family is trespassing. They have no reason to be here and probably aren't up to anything good. We've heard about people hunting on surrounding land without permission, and that is a scary thought. This space is precious to us, and we like to protect it from anyone who would do it harm. Unfortunately, I have been guilty of allowing trespassers onto our property. No, it wasn't hunters or salesmen. There hasn't been anyone on our doorstep that shouldn't be, but I have allowed other things to creep their way in. This is how we woke up this morning, and it's still coming down. 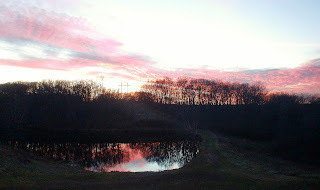 Just sitting inside praising the Lord for the beauty of His creation. Have a wonderful day bundled up in God's love! It's finally time to share the culmination of a past post - one you've probably been sitting on the edge of your seat waiting for, right? I've been thinking about these tiny cupcakes for days, and finally made them yesterday morning. Half went to work with Danny and the other half went to the newsroom with me. Only a handful made it home, but we're not complaining. 1. Preheat oven to 350 degrees. Place one tiny cupcake wrapper in each spot of a 24-count mini-cupcake pan. 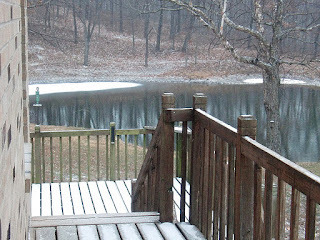 After spending six years in a state with very little snowfall, I'm so looking forward to winter in Iowa! 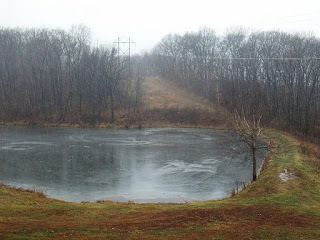 It's been predicted that we'll have some snow on the ground soon, and I can't wait! 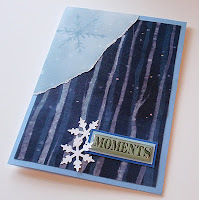 I used my snowflake punch to just make some accents for my phrase. I love the way they look against the dark tree background. Contrasting colors make everything pop a little more. And there's also a snowflake in the torn corner panel. Did you see it? It's really subtle. The look of these snowflakes on their contrasting circles proves my point about making colors stand out. Layering also adds tons of texture and makes your project more interesting to look at. It's been a very chilly week...alright, it's been downright cold! 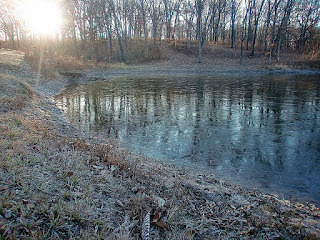 This icy scene has been pretty typical on our ponds for the past few days. And it's quite beautiful - from the warmth of inside! If you're brave enough to venture down to the water's edge, you'll quickly see that the waters are still swirling underneath that thin sheet of ice on top. It will get thicker as the weeks of cold continue, but for right now a light tap will break through that covering.